"We had Trekkie invaders at the studio all the time. Trekkies showed up pretending to be fire inspectors or janitors, and we'd discover them searching through our waste baskets." - Filmation director Hal Sutherland, on Star Trek: The Animated Series. 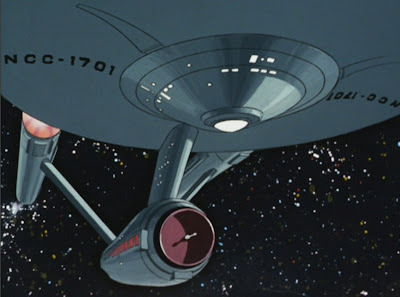 I have always loved how the Filmation's artists rendered the Enterprise. Rather than the matte finish of the original TV show, the animated Enterprise had a more metallic appearance. It certainly anticipated the finish of the Enterprise in the movie series. Filmation also did a great job finding angles to show off the ship at her best. I remember Ken Ralston (an ILM effects artist for ST:TWOK) stated that the movie version of the Enterprise only had one or two good angles on it. I suspect that the slender profile of the movie version engines did not read well at certain angles. The original series's tubular engines had mass no matter what angle they were photographed at. Finally, despite all the beautiful detail work of the movie Enterprise, it always seemed smaller than the TV version. Perhaps it's just nostalgia but the TV version felt more massive to me and angles such as the one shown here really emphasized the size of the ship.